The expulsion of the National Union of Metal Workers of South Africa (NUMSA) from the Congress of South African Trade Unions (COSATU) in November 2014 was a watershed moment. It deepened further the crisis in the Alliance between the ANC, COSATU and the South African Communist Party (SACP). In addition to fighting for a radical shift amongst trade unions, NUMSA also played a major role in the establishment of a new United Front which will be launched in 2015. In December 2014 Sam Ashman (SA) and Nicolas Pons-Vignon (NPV) interviewed Karl Cloete (KC) about a tumultuous year and the road ahead. SA / NPV: Those who are not in South Africa may think that NUMSA is responsible for undermining COSATU and working class unity. How would you respond to this? KC: When COSATU was established in 1985, NUMSA was in the centre of the unity talks. COSATU was a product of collective struggle and the federation shook the South African landscape under apartheid and played an important part in the 1994 democratic breakthrough. But COSATU, particularly over the last eight years, has almost totally shed its independence. It has become embroiled in factional politics within the ANC and the SACP. The COSATU that used to be a campaigning formation has become an organisation unable to take forward critical struggles – around precarious work, unemployment, the privatisation and commodification of services. We are challenging legally our expulsion and we have appealed for the convening of a COSATU Special National Congress (SNC). COSATU’s history is not something you walk away from easily. SA / NPV: How has COSATU got into such a situation, given this history? KC: Today COSATU is limited to forming part of the ANC’s election machinery. Beyond that, it has a real struggle to influence policy. That has been the case over the last 20 years, since what happened to the Reconstruction and Development Programme (RDP). It was a COSATU sponsored idea which originated within NUMSA. We felt the new government should do certain things to reconstruct our country, to move away from white minority rule at the expense of the black majority and to have redistributive policies to address the skewed ownership and control of the economy. The RDP became a compromise between the alliance partners but even after the compromises the RDP office in the government was closed down, without consultation. A new economic framework was introduced in 1996 and since then the ANC government has followed a neoliberal path. Today the National Development Plan follows exactly the same pattern. COSATU is a mere rubber stamp for neoliberal policies. It is useful for the ANC government to have a labour federation allied to itself, but one which will not make too many noises. Secondly, there is the old question of wearing too many hats. You have several members of the Central Executive Committee who have multiple leadership roles. The President of COSATU is also a member of the SACP Central Committee, a member of the SACP Politburo, and a member of the ANC’s National Executive Committee. So COSATU can today take a position, but then you leave COSATU and you go and sit in the ANC NEC, and you are persuaded differently. And what happens invariably is that you compromise COSATU’s position. The third problem is that the ANC and the Party have started to say to COSATU that its outlook has become ‘oppositionist’, that we speak a language which is anti-ANC and anti-Alliance, and that as a trade union movement we have become ‘too political’. That contestation has become factionalised – with one faction supporting the status quo coming from the ANC and SACP, and the other faction saying that our loyalty is to the membership, and to our resolutions, campaigns and programmes. SA / NPV: Do you think the unity of COSATU still can be saved? Or has the time come for NUMSA, and the unions supporting it, to build a new independent federation? KC: A couple of things need to be mentioned here. Firstly the dominant faction within the ‘voice of reason’ brigade is constituted by the public sector unions. That is interesting for a number of reasons. In June 2013 at the SACP 13th National Congress there was a paper delivered that called for a different way of organising in the public sector, along the lines of ‘take responsibility for the revolution’ – i.e. unions must not be in opposition to government programmes. They must be for better public service delivery, even if it is under austerity measures. So your role must be different to those in the industrial sectors or mining. And that perspective plays itself out within COSATU and it relates to my earlier point about the president of COSATU being a senior member of the SACP. A divide has developed between private sector unions like NUMSA and the public sector unions where there is no tolerance of dissent. This has brought many in the public sector to realise that the leaders have turned against their own constitutions and members. Democratic practices are thrown out of the window. People have decided it is time to challenge the dominance of a conservative, right-wing and corrupt leadership in these unions who behave as though they are shop stewards of the ANC and the SACP. This is the reason behind the call for the formation of a new public sector union. This has nothing to do with NUMSA, it would be wrong for us to call for this, but I do think that people were inspired by the resolutions taken at the December 2013 NUMSA Special Congress. In COSATU at the moment you have eight other unions against the NUMSA expulsion. They decided to demand the unconditional reinstatement of NUMSA back into COSATU and said they will not participate in any of COSATU’s structures unless that happens. COSATU’s President says over and over again that NUMSA is expelled but metal workers must remain within the federation; some have gone to the extent of building a rival to NUMSA that has applied for membership. We decided to go to court to expose the deliberate project to get NUMSA expelled and because we want to ensure there is respect for the rules of the federation. NUMSA’s view is to fight to reclaim COSATU even if you need to use the courts, but if all else fails we must begin the process of building a new labour federation. It is painful, when you give birth to something and you are no longer a part of it, but you have to move on. The reality is that only 30% of workers in South Africa are organised into unions. SA / NPV: Why do you see a need to return to the mass democratic politics of the 1980s, and how do you see the United Front going forward? KC: South Africa is the service delivery protest capital in the world; the neoliberal policies imposed on our people are resisted, but that is a leaderless resistance. It has no direction. Sometimes the protests get violent and the anger is not properly directed. We need a new United Front [after the United Democratic Front of the 1980s] to bring together workplace and community struggles. One day the SACP says that NUMSA is a ‘workerist’ formation, the next day they say we are too political, go back to the workplace. But we have always believed in community and workplace struggles coming together. We should bring communities into worker action and worker action into communities. This is a re-awakening; we have got to take our power back. We have been hijacked by a small, black elite who feast on the state through corrupt means. If we don’t get onto the streets, we are not likely to change things. SA / NPV: We have already seen an aggressive response to developments in NUMSA. Phones have been tapped, cars and offices broken into, and three shop stewards were murdered in 2014. How do plan to take on this very clear opposition? KC: It will never be easy to build an alternative to the ANC, a 103-year-old national liberation movement. In Africa and Third World countries you find huge sentimental attachment to the party that liberated the people. We have no illusions that it will be hard work. But it is necessary work politically to get people to regain confidence. Many who have remained loyal to the ANC this time around decided not to vote. If you hone into some of the metros [large municipalities], the ANC has lost its grip. This is what we must discuss at the launch of the United Front: are we ready to field candidates for local government elections in 2016, and on what platform, or would a Workers’ Party have to contest elections? SA / NPV: How do you see NUMSA going forward as a trade union of metal workers? How far should NUMSA try to steer all these different struggles? KC: NUMSA will remain a trade union and not transform into a political party. We see de-industrialisation and we think there is no better time to re-industrialise. Beneficiation [of mineral resources] is all talk but there is no action. NUMSA has a task. We have bargaining in all the metal and engineering sectors and autos. We have a plan up to our national congress in 2016 that requires internal union work to service the membership but also to speak to broader socio-economic issues. On all fronts an alternative is necessary, but NUMSA must never change the foundation on which it rests – fighting oppression, discrimination and exploitation wherever it is in society and ensuring working-class control in the economy, dealing with gender inequality, taking up shop floor issues. NUMSA is probably the only growing union in South Africa. We said in 2012 that by 2016 we ought to be 400,000 and we are getting closer. In July 2014 we had 346,000 members. You can’t feed workers with political slogans. This is why we insist that being a union, responding to the needs of workers, is central and non-negotiable. 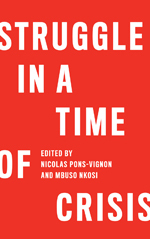 SA / NPV: How do you situate NUMSA in relation to other international attempts to resist neo-liberalism? KC: We do international work on the basis of respect for others’ independence and political views, and their respect for ours, but realising we are fighting a common enemy. We have links with many countries. In Brazil, we have relationships with the MST and CONLUTAS, but we are not walking away from CUT or PT. Old friends and new friends must appreciate that we will work with anyone who shares our perspective. We are not going to shed our relationship with IG Metall in Germany but we are making new friends in Die Linke. We are working with comrades in Bolivia and excited about the return of Morales; in the US we have many connections, and we recently received a big delegation from UNITE in the UK. In particular countries there may be tensions; we will not interfere but nobody must choose for us who we will work with. We are doing an international study tour in as part of exploring the new Movement for Socialism; and will be convening a national conference on socialism. We are steaming ahead. 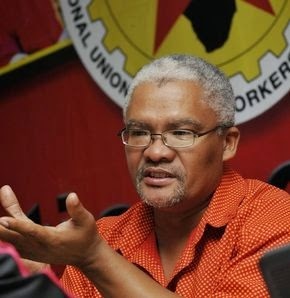 Karl Cloete is the Deputy General Secretary of NUMSA.